This entry was posted in Uncategorized and tagged believe, books, Love, movies, Neil Gaiman, Project 365, quotes, Stardust, true love. The graphic novels are awesome too! Really? 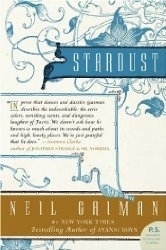 Neil Gaiman won the award for best Fantasy book for his Sandman series, the next morning they made it illegal for a graphic novel to win that prize…but that’s how amazing he is…there are at least 3 graphic novel versions of Stardust and of course Sandman is the most amazing comic ever!!! Definitely going to have to check them out. Thanks!